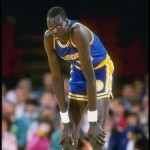 Manute Bol is dead, and the world has lost one of the most iconoclastic freedom fighters in modern times. 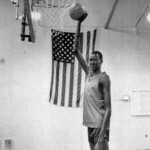 The reed-thin Dinka (Sudan) tribesman who parlayed his 7-foot, 7-inch height into a improbable NBA professional basketball career, died June 19 in Charlottesville, Va. A spokesman for Sudan Sunrise, a Kansas City-based foundation, said the cause was kidney failure, coupled with a crippling skin disease. 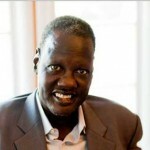 With his death, the war-torn Sudan lost a tireless and good-natured friend who gave most of his estimated NBA earnings of $6 million back to his country for a variety of peace efforts, including the construction of schools. He was once lured back to his home country with the promise of a cabinet post, only to find out he would be required to convert to Islam. When he refused, he was stranded for nearly five years. Even while playing, he went into war zones to help the Lost Boys and other refugees. Sometimes, those visits were interrupted by bombings from warlords who viewed Bol as a threat. His family was wiped out by Darfurians, but when that country became victims, Bol was one of the first Sudanese to speak out in support. A Christian, he told his people that extremists were the enemy, not Muslims. As a boy, Bol had tended his family’s cattle. According to a tale of an initiation rite, which he was often asked to repeat in interviews, he once killed a lion with a spear while he was working as a cowherder. 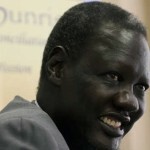 After his career, he frequently visited Sudanese refugee camps and in 2001 was offered a post as minister of sport by the Sudanese government. Bol, who was Christian, refused because one of the pre-conditions was converting to Islam. 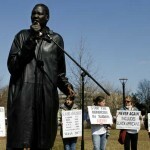 As a consequence he was hindered from leaving the country by the Sudanese government, who accused him of supporting the Dinka-led Christian rebels, the Sudan People’s Liberation Army.